Ross Castle in Killarney, my alternative to number 9. Visiting the best known places in a country is all well and good, but there are so many other options out there, and it’d be a shame not to share them with the tourists who’d like something new. You know, those ones that don’t create a whole load of fanfare for whatever reason, but still are tons of fun or very interesting. Well I decided to take the top 10 paid attractions list, and come up with my own alternatives. The only criteria for my alternative is that it had to be a similar type of place to the one from the top ten list. Some of the ones I recommend do charge a fee, while a few are free too. Here they are. 1. First on the top ten list is the Guinness Storehouse. No surprises there. My alternative: Put down that pint glass, head south to Midleton in County Cork and pick up a whiskey glass while at The Jameson Experience. 2. Next up on the top ten list is Dublin Zoo. While there aren’t too many zoos to visit in Ireland, we do have 2 fine options: Fota Wildlife Park in Cork and the zoo in Dublin. As Fota was already on the list (no. 8), I decided to choose Belfast Zoo, across the border in Northern Ireland, as my alternative. 3. Third on the fee charging list is the Cliffs of Moher Visitor Experience, in County Clare. Without doubt, very worth of some of your holiday time, but if you’re looking for something less touristy, and more challenging, then head further north to Slieve League in Donegal. 4. The National Aquatic Centre has plenty to offer it’s visitors, from the international competition pools to the endless fun at the Aquazone. I’m guessing the Aquazone plays a large part in placing this facility at number 4 on the top ten list. Looking for tons of fun in the Co. Louth area? Try Funtasia. 5. The Book of Kells. How on earth can I find a similar alternative to the Book of Kells? I can’t!! What I did find though, is that you can view the entire Book of Kells online on the Trinity Website. So let’s just say you’re down in Kerry, and you can’t drag yourself away from the Lakes of Killarney, you can enjoy the Book of Kells without so much as even thinking about which side of the road you should be driving on if you had to drive all the way up to Dublin. 6. As much as Irish people love their drop of whiskey or pint of Guinness, we are also a crisp-mad nation (that’s potato chips to our American cousins). And there is simply no better crisps that those that you’ll find inside a pack of Taytos. Tayto Park in County Meath is at number 6. I’ve never been to Tayto Park, but judging from their promo video it looks like a lot of fun. These types of outdoor activity parks are becoming more and more popular around Ireland, but parks as extensive as Tayto Park are not plentiful. My alternative: Mellowes Adventure Centre. 7. St Patrick’s Cathedral is very worthy of a spot on the top ten list. And it’s always nice to spend a little money somewhere, knowing it’ll be reinvested, and not go in to the pockets of some high earning execs. My alternative, also in Dublin: Christ Church Cathedral. 8. Number eight is Fota Wildlife Park. I truly do love a day out at Fota. I never miss it when I’m back home in Cork. It’s such a unique place where you can get up close and personal with many kinds of animals – kangaroos, meerkats and more. I think I’ve run out of zoos in Ireland, but if you’re looking for wildlife, then a day spent enjoying Killarney National Park will have you smiling. 9. Blarney Castle. I’m going to hazard a guess here, that there is no where else in the world, where so much money has been made, from tourists kissing a rock! We really cashed in on that one :). Ireland is jam-packed with amazing castles for you to visit. I’d tell you visit them all, if you had the time. 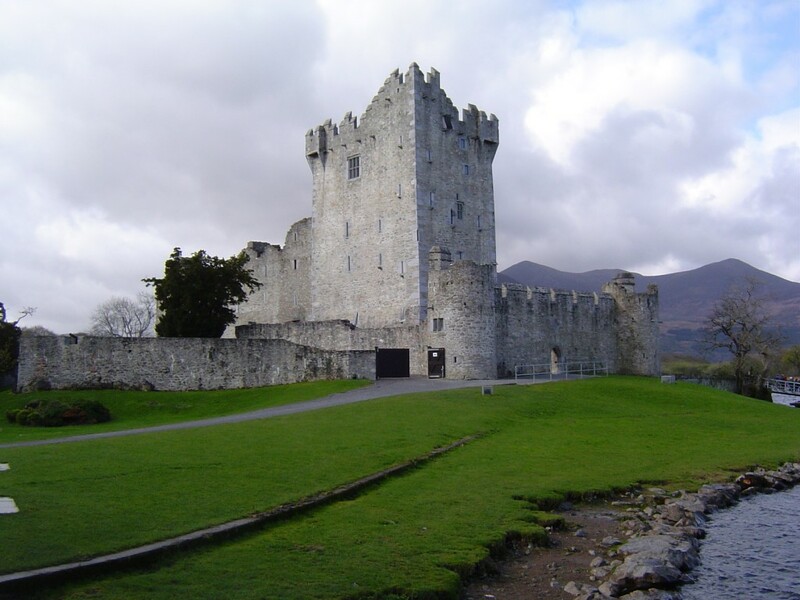 However, if you have time for just one more, then a quick spin down to Killarney to Ross Castle will not disappoint. You can even kiss it if you want to! Just don’t let them see you doing it. 10. Another fine Dublin attraction made it on to the top ten list: Kilmainham Gaol. As a proud and biased Corkman, I’m going to send all of you over to visit the Cork City Gaol. Take a look at some of the pictures I took there last year. WAIT…don’t go!!! You know the street entertainers that tell you not to leave without dipping into your wallet after the show is over? Well I’m asking the same now, just in a different way. Let me hear from you in the comments below if you have a few alternatives of your own. I’m sure many of you reading this will have some suggestions that we can all benefit from. Thanks! DunAengus on the Arans for the Cliffs of Moher. Mellifont Abbey for Blarney Castle. The Dingle Penninsula drive for Foto Wildlife Park. ANY pub in Ireland for the Guiness storehouse. The Famine museum in Dingle for the Kilmainham Gaol. …just to name a few alternates! Great alternatives, Kerry. Thanks for taking part. You’re right. It’s in Donegal in the NW. There’s a few on there I have’t heard of. Thanks for the suggestions. 3, Down Patrick and Benwee Heads, Mayo Achill has a couple as well. 4, Achill Island, 5 Blueflag beaches in a small area. 8, The Donkey Sanctuary, Liscarroll they deserve a mention or two. 10, Wicklow Gaol because Gramps lived there once..
Great list Tony, thanks! Sorry to hear of the connection to Wicklow Gaol. Have you visited it? I must look it up. Nothing to be sorry about, the gaol was reopened for the holding of “Loyal Irish” after WW1 until Independence. Gramps had a small dispute with the B&T’s and had a couple of months to think about things. Did go in many years ago on an open day but I will have to go and have a fresh look now its a tourist attraction. The tans weren’t to be messed with! Luckily he wasn’t in there too long so. Not too pleasant a place back then I’d say. Just reading a little about Wicklow Gaol on their site. Go mbannaí Dia dó. (Agus go raibh maith agat, a Liam. Tá an t-airteagal an-suimiúil. Go raibh maith agat, Pádraig. An bhfuil aon mholtaí agat dúinn? I love your list, Stephanie, especially the Chocolate Factory and the Pirate Adventure Center. I’ll have to look that one up for the kids next year. Liam…marvelous idea to pull together a list of alternatives…and I’m so happy to see plenty of points of interest north of the border. Well done! 1. I agree wholeheartedly about Jameson in Midleton! And while it isn’t about whiskey or beer, the factory tour in Belleek is probably the best factory tour I’ve been on. Ever. Highly recommend it. They walk you right through the factory proper and you can have a chat with the workmen at their benches. 2. If you’re going for animals (and taking into account that Fota is already on the list), how about the sheepdogs at Caherconnell Stone Fort? We saw an entertaining display of their prowess with both calves and sheep. Skipping to 7 – Galway: Take in the contrast in churches by visiting St. Nicholas Collegiate Church and then crossing over the bridge to Galway Cathedral. 9. While I will admit to visiting Blarney (and enjoying the gardens and rock close), I would suggest Kylemore Abbey as well. You can tour a few rooms of the house, visit the Gothic Church, and walk the walled garden. And the Connemara scenery is a bonus. If you’re crossing the border, then Dunluce Castle is another good alternative to Blarney. Lots of story and well told in the materials. Also, just to say you braved it, Carrick-A-Rede Rope Bridge! Newgrange is awesome – the burial/ritual mounds are astounding. Also suggest Mol’s Gap in the Ring of Kerry with the Torc Falls, love the Burren and Caherconnell which not only has sheep dog demonstrations but also has a ring fort that is under excavation. Loved flying hawks at Ashford Castle. Bunratty Castle is a trip back in time. Agree with Kylemore Abbey and that entire area. Boat out to Skellig Michael is a trip even if you can’t make the landing at Skellig Michael (Ring of Kerry/Portmagee). Looks like I have much reading and research ahead of me. We’ll be back in 2 years to celebrate our anniversary, many of these spots I’ve not heard of. Planning to focus on the West side, loved Dingle and will go back there for certain. We also enjoyed Westport and Galway but only spent a few hours in each. Would like to extend that to a couple days in each! Any suggestions on house rentals?? What a great way to celebrate a milestone anniversary. You should certainly spent a bit more time enjoying Galway. A few hours wouldn’t cut it. And don’t leave out Clare (The Burren, Cliffs of Moher etc), and Sligo. What kind of house rentals are you looking for? Long term? Small? big?